Ancient grain renaissance. A system called mezzadria, set in place in most Tuscan agricultural areas for many centuries, is a socio-ecological production landscape (SEPL) consisting of a share cropping system whereby the farmer pays a share (usually half, as the etymology of the word mezzadria suggests) of the products to the landowner as rent. A podere, a piece of land surrounding a house assigned to a mezzadro of a size manageable by a family, is almost entirely self-sufficient. The beauty and uniqueness of the Tuscan landscape may be attributed mainly to the system of the mezzadria. This paper discusses the birth of project that is a unique cooperation involving the University of Florence, a miller, bakers, farmers and local government to promote ancient varieties of wheat grown, milled and transformed locally. Initiatives, such as the non-profit Ancient Grains Association that sponsors local cultivation, milling, baking and pasta production, reap substantial benefits for the local population. The ancient grains project brings back know-how and jobs to the SEPL. It promotes social aggregation around the agricultural calendar and traditions. It sponsors sustainable agriculture, and increases biodiversity in wheat and local flora and fauna. Finally, it brings to the consumer better quality products with several health benefits. Tuscany, a region in central Italy with an area of about 23,000 square kilometres and a population of almost four million inhabitants, has been cultivated with different types of grains (e.g. common wheat, spelt, durum wheat), olive trees and grapevines since Roman and Etruscan colonisation going back to the sixth century B.C.E. In addition to being major consumers and exporters of wine and olive oil, the Romans, like the Greek and the Etruscans, considered themselves largely a bread-eating population in comparison to other populations. These agricultural features have remained largely unaltered in Tuscany for the past two millennia. Gradually, in addition to the cultivation of these three types of crops, the raising of pigs, goats, chicken and cows was introduced. The resulting agro-silvopastoral system has been in place for centuries in most of Tuscany and constitutes the base of the socioeconomic fabric of Tuscan towns. Most areas have developed their own varieties of wheat as well as their own types of grapes and their own olive trees. Some areas even distinguish themselves from others in the way they cure their meat. The combination of agricultural products and systems, traditions, festivals and cultural events all contribute to the complex socioeconomic system. 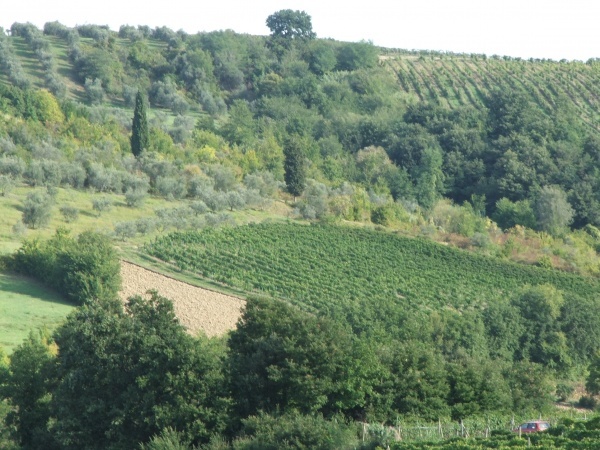 Tuscany’s land distribution has gone through a series of changes in the course of history. In ancient Roman times (from the first century C.E. ), a system of villae was established in some areas of Tuscany (The Romans colonised large parts of Italy, creating a system of farms with both an urban and a rural part. Those Roman urban unities later became villages and shaped some of the Italian landscape. For in depth analysis of the process, see Dyson (2003) and Francovich (2003)). In the Middle Ages (12th century), land, owned by the church and the aristocracy, was organised into fortified towns. This latter land distribution was then slowly replaced by a system called mezzadria (For a detailed history of mezzadria see Nanni (2012)), a socio-ecological system that shaped most of the Tuscan landscape from the Middle Ages to the 14th century. The mezzadria system is a share cropping system whereby the farmer pays a share (usually half, as the etymology of the word mezzadria suggests) of the products to the landowner as rent. Due to its nature, the mezzadria system allowed landowners to sit back and relax without having to make any significant investments. They provided land and houses (that they already owned by inheritance) to the mezzadri, the families who worked the land. In return, the mezzadri had to work the land all year long and provide half of every harvest (once a year for wheat, grapes and olives) to the owner. The conditions in which the mezzadri worked depended on the type of soil they were given and the fairness of the owner. As large areas of land were difficult for a single family to farm, the land was divided into small plots, which were then divided into smaller parts and rows assigned to olives, wheat and grape cultivation, thus transforming the hills into a huge patchwork. Every family of the mezzadri had to provide their own food and cultivate the traditional crops of grains, grapes and olive trees, as well as raise as many animals as they could. Other plants such as chestnuts, walnuts and apple trees were cultivated in different areas of Tuscany. The most common animals raised were pigs, chickens, goats and cows. They used oxen (castrated bulls) to work the soil, and chicken and pigs for animal protein or to produce the typical salami and prosciutto salted meats. Goats and cows were usually used for their milk and occasionally for their meat. Woods were a fundamental resource for firewood, for acorns to feed the goats and pigs, as well as for foraging different berries, wild asparagus, mushrooms, truffles, etc. The system was efficient due to the cycle of each harvest, being naturally timed so that the different harvests alternated with each other and did not inundate the mezzadro with harvests at the same time. Thus, olive tree and vine pruning was carried out in the spring, canopy management occurred in the summer, and the harvesting, threshing and ploughing the fields for wheat were undertaken in August. In the fall, the grape harvest was carried out during the months of September to October. In November, the olive harvest occurred and the year would conclude with pig slaughtering in December. The system created almost no waste—the remaining hay and straw from the wheat harvest was used to feed the cows. The discarded branches of olive trees and stems of the vines could be eaten by the goats, and the grape skins provided food for the chickens. This system could be reproduced at a farm with very little external input required. A podere, a piece of land surrounding a house assigned to a mezzadro of a size manageable by a family, is almost entirely self-sufficient. The beauty and uniqueness of the Tuscan landscape may be mainly attributed to the system of the mezzadria. Due to the mezzadria system, large monoculture was avoided as every podere was organised in a way that integrated the various different types of crops within its land. The podere usually consisted of a farmhouse on by top of a hill surrounded its crops: the grapevines and olive trees would be arranged in rows and separated by an area allocated for wheat cultivation (Figure 1). Some areas would then be reserved for woods, a well, a threshing area, a cellar and a barn. Activities were held by extended families in front of the barn, as shown in this picture from the early 1900s (Figure 2). The mezzadri divided the Tuscan territory into various poderi, with borders shown by pointy cypress trees, shaping the landscape that, years after the end of the mezzadria, may still be enjoyed today (Figure 3). As grape cultivation has been the most economically rewarding, vineyards are now of larger sizes than in the past. However, in most areas it is still possible to see mixed landscapes with woods, olive trees, wheat fields and vineyards. Next to the vineyards and along rivers one can still find several types of willows. For example, Salix viminalis and Salix alba are still used to tie the vine’s canopy. The kinds of trees found in woods vary according to altitude and the presence of water. In most Tuscan areas poplars, oaks, elms and field maples may be found. Truffles and mushrooms are also found in the woods and harvested by locals. Likewise, farmers have a tradition of picking many wild plants to eat according to the season. For example, several kinds of wild asparagus, borage and rocket salads of the Brassicaceae family are picked, as well as plant species of the genus Silene of the pink family (Caryophyllaceae) and Cicerbita of the aster family, Asteraceae. This is not true of several areas where viticulture has invaded all possible areas and the use of herbicides has reduced biodiversity. House distribution may be also traced back to the mezzadria as each farm is situated near or in the middle of its own land. With the transition to modern agriculture in the middle of the 14th century, some of the mezzadri were able to buy their houses and land. In other cases, large landowners have continued their agricultural activities with hired workers. Tourism has also shaped the Tuscan landscape. Agro-tourism (hotel farmhouses) has emerged in many places, houses are rented out through the Internet and it has become trendy for the wealthy and famous to acquire properties here. Several issues have affected the socioeconomic system. The necessity to lower the price of wheat arose following the transition to modern crops and the pressure of globalisation. In order to do so land was abandoned or it was exploited without the necessary maintenance. Water management must be carried out and canals and ditches kept in order all year long; however, in order to lower prices, moderns farms have cut their maintenance work. This has resulted in larger vineyards and bigger arable fields that cause increased soil erosion and landslides (Landi 2004). In addition, it is now known from numerous studies that the use of chemical fertilisers, insecticides and herbicides has polluted some of the aquifers, reduced biodiversity and damaging pollinators such as bees (Marshall 2001). Wheat cultivation has been the most impacted due to the fact that wheat has become a global commodity that is cheaper to import than to produce, therefore distorting the relationship between price and the cost of production. 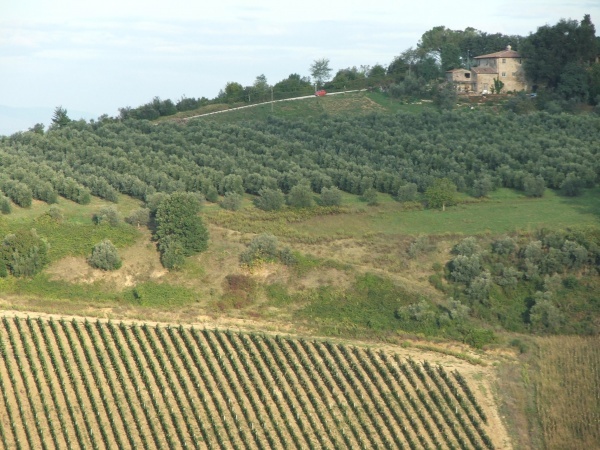 Similarly, the decreasing cost of olive oil worldwide favours importing oil from other areas in the Mediterranean rather than producing it in Tuscany. Grape cultivation is the only one of the trio that is still predominantly produced in Tuscany. This is impacting producers who have abandoned or are considering abandoning wheat cultivation and olive production. According to Casini Benvenuti (2013), import statistics show that all sorts of agricultural products, such as oil, wheat and raw meat, are imported to produce several products, including cured hams and salami. This has a negative effect on agricultural practices that must adapt to global competition with lower prices for wheat, meat and so on. All of these phenomena thus wield a negative impact on socio-ecological production landscapes (SEPLs). Over the past 20 years, local farmers have again started to produce local agricultural products thanks to increased demand for local products. An increased awareness among consumers and producers, and actions by local governments and associations have begun to change the production method from international imports to local production and transformation. Many different areas of the SEPLs have been involved. Grape production has started to change with a boom in organic producers and the re-discovery of indigenous varieties and natural wine-making techniques. Local vegetable production has started again thanks to local purchasing groups who are willing to pay slightly more. Supermarkets have commenced promoting local products. Producers associations with the ability to lobby local government have arisen and some have managed to even reach Brussels and the European Union with the results of obtaining some funds and recognition. Local government is now aware of the need to manage the land in a new way after an increase in landslides mainly due to modern monoculture techniques. Because of the complexity of recent events, it is difficult to analyse all these issues at once. This paper will focus on one case of a very local Ancient Grains project that started in Montespertoli ten years ago. Montespertoli is a Tuscan town with 13,000 inhabitants and an area of 125 square kilometres in the Florence area. Its economy is mostly based on agriculture and tourism with some inhabitants commuting to Florence for work. All Tuscan indigenous varieties of wheat, called here ancient varieties, may be traced back to the work of a group of geneticists in the early 1900s (Becherini 2013). The first cereal genetic research centre was established in 1919 by Nazareno Strambelli. Different research stations were created in various parts of Italy in the following years. Professors would then move around the stations and teach where help was required. In the beginning of the 19th century, also due to fascist government policies, Italy was self-sufficient in terms of wheat and was even exporting. By 1940, new varieties were selected and synthetic fertilisers were introduced. Strambelli and subsequently Marco Michaelles selected many varieties that were used until the 1970s (see Benedettelli et al. 2013). A fundamental role was played by the research centre located on the farm of the Count of Frassineto in Arezzo, a province of Tuscany. One of the main features of these research projects was that the selection criterion for wheat was based on how adaptable the grain was to Tuscan soil and not how efficient the grain would be for industrial purposes. The selection of new varieties and research in all fields of agriculture were essential to the success of Tuscan food in Italy and worldwide. The model, based both on tradition and quality, gained Tuscany the international reputation that it still maintains. The Ancients Grains project has focused on those ancient varieties selected as best adapted to the Tuscan soil and climate, the most replanted of which are now Verna, Frassineto, Gentil Rosso and Inalletabile. They are tall varieties, with lower yields than modern varieties. They have similar amounts of protein content and they do not require fertilisation. Recent modern techniques and globalisation have begun to obstruct the traditional Tuscan model and a balance needs to be found. Following industry’s demand for higher performance gluten and reduced costs, techniques have changed and modern dwarf varieties with different types of gluten have been planted everywhere causing most old varieties to disappear from the fields. As previously mentioned, over the past 40 years, farms have felt the pressure to cut costs. Local consumers also have increasingly chosen cheaper agricultural products as their purchasing power was reduced by continuous economic crises, the latest in 2008. In some areas, especially cereal cultivation, competitive imports have discouraged cultivation. Similar conditions apply to olive tree cultivation, and to a certain extent the drop in prices has also affected viticulture. The result of having to reduce costs is that farmers have less resources to invest in water management, wood management, sustainable farming and other key field techniques. Today, Tuscany imports more food than it produces. In 2012 Tuscany exported food worth 7.711 billion EUR and imported food worth 9.898 billion EUR (Rossi-Benvenuti 2014). From the year 2000, a few positive factors have slowed the deterioration of farming and wood management. On one hand, the boom of agro-tourism (Tuscany accounted for 33% of total market share in Italy in 2012 (Rossi-Benvenuti 2014)) has provided resources for agro-tourist farms to maintain their fields and landscapes. Many farms were restored, roads were repaired, and farms invested the revenues from tourism in their agricultural projects as laws require that more than 50% of revenues need to come from agriculture to maintain an agro-tourist farm status with tax benefits and incentives. On the other hand, incentives given to convert to organic agriculture and modernise agricultural practices in all fields have assisted in both the development of sustainable agriculture and the heightened quality of products. The highly acclaimed technological innovations in agricultural methods were introduced mainly for the benefit of large industrial companies that were able to influence government decisions. Modern wheat cultivation reduces biodiversity and damages the environment. Modern wheat processed to become white flour has lower nutritional value than previous varieties (Adom 2007) and contains high performing gluten that is good for the baking industry but difficult to digest for humans. Industrial methods in the food industry remove jobs from places of production, also putting an end to local traditions. Research by the University of Florence has played a key role in bringing back ancient varieties. The first institute to initiate biodiversity actions was the Scuola Superiore di Agraria in Florence. Ancient grain cultivation was initiated in the 2000s decade with pioneers such as the Florìddia Farm in the Pisa area and some other farmers in Siena. Ancient varieties have a lower yield than modern ones, but they are similar when organic agriculture is carried out. Ancient varieties also have the advantage of reducing costs for buying seeds, chemical fertilisers and herbicides/pesticides and therefore are not favoured by the agro-industry. In fact, ancient grains were not selected to perform better with modern chemical fertilisers or other agro-chemical products. Some of their features are counterproductive to large-scale industrial purposes. For example, their higher stalks make them more vulnerable to being snapped by the wind. The cultivation of ancient varieties supports more sustainable practices—their roots are able to extract more nutrients from the soil, so they demand less fertilisers. Likewise, they tend to grow taller than weeds and therefore help preserve biodiversity by reducing the use of herbicides that hinder weed reproduction as demonstrated in the Marshall study (Marshall et al. 2001). Ancient grains also do not require anti-fungal products as their height keeps the grains away from the soil’s humidity, however making them, as previously mentioned, more subject to fall with strong winds and storms. Regarding the cultivation of wheat specifically, the Tuscan Region has taken some actions to ensure ancient varieties of wheat (and some ancient varieties of grapes as well) do not disappear. With the regional law, L.R. n. 64/2004, the Regional Register of Vegetal Varieties with Risk of Extinction was created. University farms and external farmers were involved in replanting these varieties. Since abandonment of the ancient varieties, some have been lost; however, many were also saved. The Tuscan Region has also worked to maintain the Tuscan landscape with its own peculiar features. The Landscape Plan (D.lgs 42/2004) has the scope of preserving and enhancing the value of the Tuscan territory. The plan distinguishes itself from older ones because it involves the whole territory instead of being mainly addressed to “save” beautiful areas. This paper will not be able to analyse this plan, as it is a complex regional plan that deals with the placement of land-use activities, infrastructure, and settlement. Tourism has played a fundamental role in pushing the Tuscan Region to introduce a law favourable to agro-tourism (incentives and tax breaks for companies engaged in both tourism and agriculture). Subsidies given for the refurbishing and restoration of old farms have improved the level of accommodations offered so that Tuscany has increased its share in numbers of tourists. The same farms have used profits from tourism to improve their landscapes and agricultural practices. Socially, agro-tourism has created plenty of jobs, stimulated local artisans and increased the demand for artisanal food production. 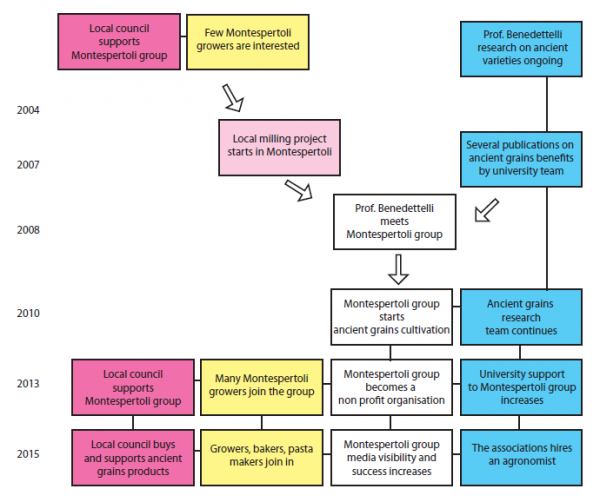 Focusing on the Montespertoli area, nearly one-third of farmers in the Montespertoli Ancient Grains Association have been able to sustain initial costs as they invested profits from agro-tourism. Several studies have shown that ancient varieties are more beneficial to human consumption. One of these studies shows that ancient grain varieties have higher nutritional value. Benedettelli (2010) focuses on the effect on a set of individuals of short-term dietary intake of bread made with a selected variety of ancient grain grown in Tuscany. Twenty healthy subjects (median age, 39.5 years) were made to follow a 10-week diet containing bread (150 g/day) made from the test grain (test period) and, for the same period, a diet containing commercially available bread in the same quantity (control period) (As shown by Sofi (2010): Short-term dietary intake of whole grain bread obtained from an old grain variety seems to impose a favourable status with regard to lower circulating levels of markers of atherosclerosis.). Results highlighted the high content and unique composition in lignans of old cultivars, suggesting they should be used to produce a wide range of regular and specialty food products naturally enriched with health-promoting compounds. Several other studies by Benedettelli (2013) seem to demonstrate that ancient grains contain more easily digestible gluten (Benedettelli 2013, p.41) and a more diverse variety of nutrients, and thus have a positive impact on reducing IBS (irritable bowel syndrome) and gluten intolerance. Their genetic variety, their adaptability to local features and their performance in low environmental impact agriculture make them suitable for a more sustainable agriculture. To preserve their nutritional value, ancient grains need to be stone ground and not decorticated in roller mills that only leave the starch of the endosperm of the seed. In addition, sourdough is preferred when making bread, while traditional methods that do not heat the dough are favoured for making pasta. The University of Florence developed optimal practices to be passed on to all workers in the supply chain from the farmer to the baker so that the best conditions could be established (Several publications in Italian were passed on to all people in the chain. Agronomists have followed the work in the field, and microbiologists and wheat experts have helped to find the best ways to mill the wheat, usually stone, and then make bread and pasta. A book has been published, Pane Nuovo da Grani Antichi, (Benedettelli et al. 2013)). In addition to cultivating grapes and olives, Montespertoli has for centuries been a strong wheat producer,ts wheat locally and to nearby towns such as Florence. In the Virginio valley in Montespertolin mills were operating up to the past century. Today, only one mill remains, no longer situated on the Virginio river, but in the centre of town as water has been substituted with electricity. It is at Molino Paciscopi that the Grani Antichi Association (Ancient Grains Association) was created. Initially, Montespertoli had been trying to sell its bread locally as part of the Tuscan initiative, “Filiera Corta.” Within this project, the Tuscan Region has been sponsoring local producers and small reselling businesses to work together to sell food made within a 70 kilometre range. Councils, cooperatives and other businesses were also able to obtain financial help from the region to organise markets to sell local products. (This operation still continues today.) The locally grown wheat from modern varieties was milled at Molino Paciscopi and sold to local bakeries. Bread was made and sold in the Florence area. The project was started in 2004 and worked initially, albeit at a small scale because this bread does not have sufficient unique features to be able to go beyond a couple bakeries and few selling points (Figure 4). Figure 4. Amount of bread flour milled in the first short chain project in Montespertoli: The first short chain project in Montespertoli concerned regular modern wheat, milled and baked in town. Despite advertisements and the creation of a brand, it was not very successful and the wheat milled slowly decreased every year (Source: Montespertoli Ancient Grains Association). Figure 5. Connections between university work and the short chain project: the diagram shows how the university work and the short chain project connected and how success was determined by the role of different stakeholders interacting. In 2008, the situation changes. Prof. Stefano Benedettelli from the University of Florence meets the miller Gianni Paciscopi from Montespertoli, who is quickly convinced to start working with the ancient varieties the university was testing, instead of using the modern varieties (Figure 5). A friend and client of Gianni Paciscopi, the baker Marco Panchetti, starts collaborating with the miller and then a few producers are convinced to try the new “old” grains they had never worked with before. Industrial processes had previously killed the links between producer, miller, pasta maker, baker and consumers. Ironically, this link has been a difficult one to recreate, also due to the fact that traditional techniques have been lost. 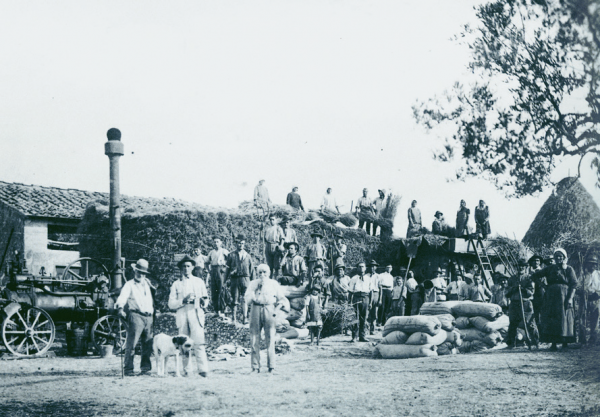 The stone-grinding mill had nearly been abandoned and was used only once in a while to grind low quality grains for animal feed. Sourdough bread was no longer made in Montespertoli, and ancient grain varieties had been forgotten. This forced all the participants of the project to acquire new (old) professional skills. The work in progress is really a combination of different heritage skills. The university team, led by Prof. Benedettelli, helped select the wheat varieties and develop the processes for milling and bread and pasta making, as well as made progress on research on health benefits. Francesca Castioni, an agronomist, follows the producers in the field. The miller, bakers and pasta makers prepare the products and sell them, helped by other members of the association. Thus, the environment benefits as the association ensures that all wheat is grown sustainably and best practices are respected in the agricultural fields. 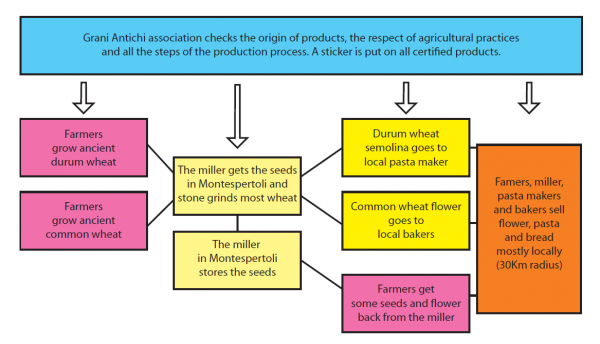 Consumers benefit as they can buy a better product that is quality controlled by the university and the Grani Antichi Association (Figure 6). Guidelines that involve all the steps from growing the wheat to milling, baking and making pasta were created based on university research to guarantee a healthy and high quality product. For example, guidelines in the field prohibit the use of herbicides and chemical fertilisers. For grinding wheat, stone is preferred as roller mills tend to take away more nutrients. For making bread, sourdough is to be preferred, and for pasta making, there is a maximum temperature for the drying process as high temperatures tend to decrease quality and nutritional value. Discussions on this project started in 2008. As early as 2010, wheat production began and the non-profit Ancient Grains Association was registered in 2013. The aim of the organisation is to protect and help producers respect the guidelines and promote ancient grain products. The association also acts as a facilitator of cooperation among stakeholders. It confers with the university team and spreads good practices learned to the growers, and it talks to local politicians to help them determine the right policies. Likewise, it talks with consumers and producers so that information passes from the beginning to the end of the chain. It also makes sure that the higher prices paid by consumers are transferred to the farmers. Thanks to promotion by the association, help from the university and the higher price paid by the miller for the ancient wheat, 20 producers have joined since the project was initiated, and 450 hectares are dedicated to ancient grain production, though due to crop rotation only about 150 are constantly planted. The biggest growth in term of hectares and grain produced was attained in 2015. The miller and the baker agreed that producers should have a premium price for their effort. In 2015 they were paid 60 euro cents per kilogram for their wheat, as opposed to 20 cents for modern non-organic wheat. As of March 2016, industrial bread can cost as little as one euro per kilogram. Montespertoli bread made with regular stone ground flour costs two euros per kilogram, and ancient grain bread between 3.5 and four euro per kilogram. Flour costs are 35 euro cents for industrial, 45 cents for local flour, 80 cents for stone ground flour and one euro and 40 cents for ancient grain stone ground flour. A higher payment is required for many reasons. First, ancient grain cultivation is not recognised by the subsidies system as seeds are not available in the mainstream market and yields are usually smaller than modern seeds. Also, wild animals seem to prefer ancient grains to modern ones thus fields of ancient grains sustain more damage than conventional ones. Rewarding the farmers for their work is clearly one of the main reasons farmers are willing to grow ancient varieties. The reward is guaranteed by the miller who buys the wheat and the association that owns the trademark. 2015 has seen a record production of 80,000 kilograms of wheat, with three pasta makers and three or four bakers and flour shops selling the products in all areas of Florence (Figure 6). Many articles have been published and television programmes dedicated to ancient grains. This is not an isolated project. Similar initiatives were started in Tuscany and in other Italian regions from Liguria to Sicily. Although the models are similar, the Montespertoli project is one of the few that makes sure the farmers are paid more and that intentionally creates social aggregation around the project. One of the main purposes of the Ancient Grains Association is to help create other associations in Italy. Many groups of farmers, together with local councils, are currently gaining assistance to start up similar projects. Many of the requests for help received by the association are from groups of farmers associated with a local council that acts as catalyst. 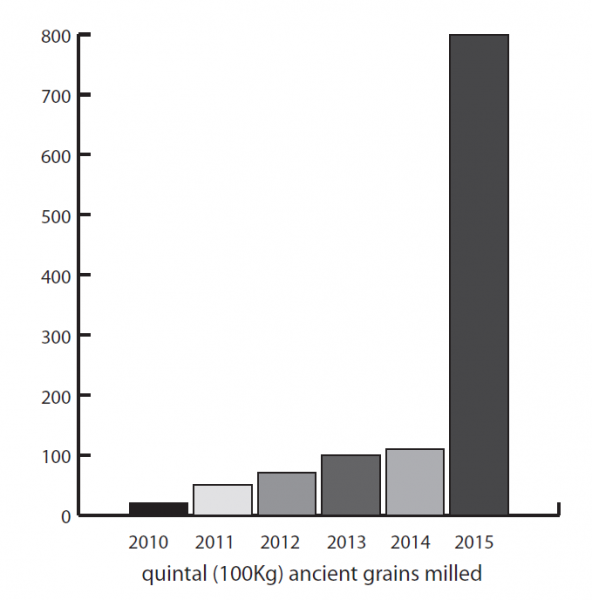 Despite higher prices, ancient grain products are very successful. They are sold both in specialty stores and at local supermarkets, as well as used in local schools. Clients are happy as they feel they are doing something for their health, the local economy and the environment. Demand is rising from all economic and cultural groups of people. Local promotion and education has been a key factor in fuelling demand. The local council includes ancient grain products in all events and even the Florence city council has provided assistance in promoting the association. Figure 7. Amount of ancient grain wheat milled in Montespertoli: the sharp increase shows the success of the project. Source: Montespertoli Ancient Grains Association. The members of the Ancient Grains Association are the wheat growers, the bakers and pasta makers, the miller and the consumers that feel they want to take part in it. Several hundred people have joined and every week there are new members. Each person donates a small fee, and the money is used mainly to promote ancient grains. Members meet to make important decisions on how to control the process, create events, and partner with other associations and local councils. While the association guarantees the origin and production of products, the entire process is under the supervision of an agronomist and receives help from the university. It could also be viewed as the first step in a process that could subsequently be recognised at the European level for protected agricultural products such as PDOs/DOP or PGIs/IGP certifications (DOP or Denominazione di Origine Protetta is Italian Protected Designation of Origin (PDO) in English and guarantees the origin of a certain product. IGP or Indicazione Geografica Protetta is Protected Geographical Indication (PGI) in English and was created to protect and guarantee the quality of a product made in a geographical area and by a specific know-how or tradition). This particular association also promotes a certain type of lifestyle and healthier agricultural methods. Grain cultivation needs to be organic, which is for example not required by IGP or DOP. In addition, the way the fields are worked increases biodiversity both in wheat and in local flora and fauna. 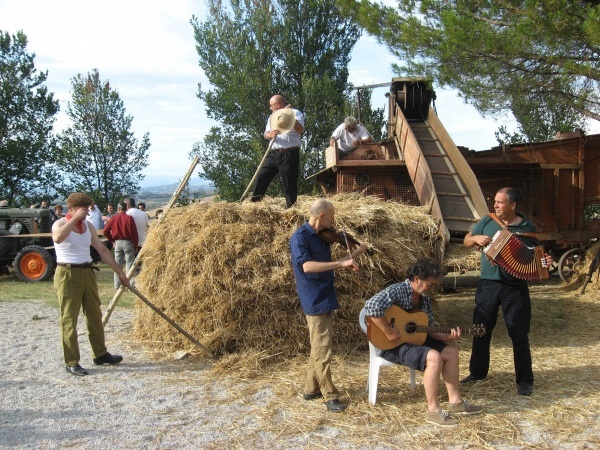 The association also sponsors local cultural activities, including threshing with ancient methods in local costumes (Figures 8 and 9) and cultural activities involving bread and pasta with the revival of ancient recipes and festivities. Figure 8. Wheat party (photo by Comune Montespertoli). The association’s biggest achievement is the promotion of social aggregation around the theme of agriculture following customs that have been practiced for centuries in the area. In short, these practices bring back tradition to this SEPL instead of outsourcing all food production to industrial sites that have no relation with the area whatsoever. The association has asked the mayor of Montespertoli, Giulio Mangani, what actions he has taken and intends to take given the presence of this association in his territory. Before Mangani, the local council had sponsored, promoted and helped create Montespertoli’s brand bread and the Montespertoli Chianti wine subzone. Both initiatives were not very extensive and did not create many jobs. Thus, it seems that sponsoring a product when the producers and consumers are not interested results in failure. In the future, Mangani’s policy will be to not impose any agricultural regulations or laws, but to let initiatives spring up directly from the citizens, and then to support them. If initiatives arise from a need deep in the social structure of the SEPL, there are greater chances of them being successful. For example, projects that were begun with regulations on wheat and wine did not succeed. The Ancient Grains Project, on the other hand, initiated based on an idea of the university and supported by the people and producers, has been successful even without subsidies. Similarly local grape varieties that have not been supported by any government initiative have seen some success. These examples reveal the appropriate path of regulators. On the one hand, there needs to be demand—people are interested in healthier products and local varieties. On the other hand, there needs to be an endorsement by the producers, in this case a miller and a passionate baker, backed by the necessary knowledge of the university team. Support from the local council is also required, and in fact, the first president of the association was the former agricultural attaché of the local government, Patrizia Ducci. Projects also need to be open to everyone and not restricted by regulations. Mayor Mangani believes that it is best for the administration to listen and help when a good idea comes along. Incentives are in most cases useless unless the needs and the passion of local people are involved. In this particular case, the passion started the projects and also stimulated the initial group to find a way to make the project economically viable for all the actors involved in the production process. Finally, the Ancient Grains Association will bring numerous positive consequences for the future. A considerable amount of land, previously abandoned, has been recuperated, and crop rotation has been introduced. Farmers have started to plant legumes and forage for animals again. If the land is managed properly, the danger of landslides will be reduced. All of this will bring the previously disappearing farming community together again, at least partially. The council is extremely happy that local traditions such as wheat threshing have started again, even if symbolically. Now children will know where wheat comes from. The council has also asked local schools to buy local products including ancient grain ones. Going forward, the city council will be engaged in revealing best practices, financing local events, and sponsoring local products that are healthy and organic. They also have created an agricultural reservation with common rules so that each farmer will be responsible for a part of the project and will receive some funds. Some large farms are already converting to this new (old) system hugely benefiting the environment and the health of people. The university team will continue to cooperate with the Ancient Grains Association to develop hybrids of old varieties that can best adapt to local needs. Initiatives such as the non-profit Ancient Grains Association that sponsors local cultivation, milling, baking and pasta production reap substantial benefits for the local population. Not in order of importance, the Ancient Grains Project brings back to the SEPL know-how and jobs. It promotes social aggregation around the agricultural calendar and traditions. This new social aggregation is welcomed by local governments as it reduces social exclusion, increases tourism and creates jobs. Best practices from the SEPL have been incorporated by the council in the selection policies for food providers that serve the local schools, with the association’s stamp of approval required to be on the bread or pasta. Other policies have been created so that local food producers selling at council events are required to use products from SEPLs (e.g. bread, wine, vegetables). The university has played a key role by selecting the best varieties and sponsoring them with the growers. Figure 9. 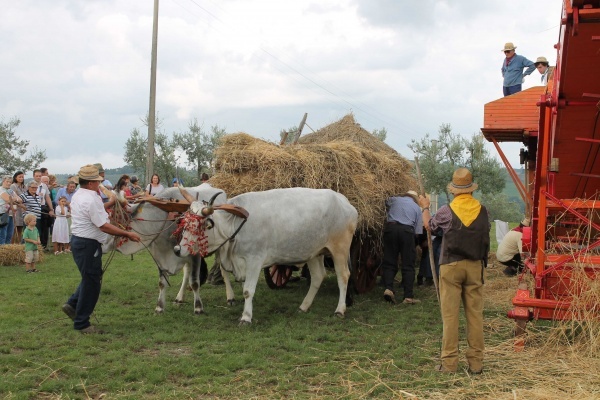 Wheat threshing by the Ancient Grains Association (photo Comune Montespertoli). Both the Ancient Grains Association and the local council sponsor sustainable agriculture that increases biodiversity in wheat and local flora and fauna. Cooperation between the three stakeholders is a key factor for success. An analysis of the birth of this project shows that it was surely initiated by academic research on biodiversity, then gained attention and spread to SEPLs in the Tuscan Region, resulting in the start of the Filiera Corta project. University help was again fundamental in finding the right plants and the right methods. At a later stage, the local council provided marketing support and sponsored initiatives to spread the idea, as well as support for traditional gatherings. The passion of the operators involved is the bulk of the work, but they need continuous support from local politicians and the university team. Eventually these innovations will need to be supported by the national and European agricultural system, such as including ancient varieties in the subsides and rewards system. In order to move in this direction, an association that is capable of talking and mediating among all stakeholders and that also has some political weight in town decisions, as well as the ability to lobby higher political institution, is required. At the moment, no ancient wheat association in Italy has enough weight to lobby the Italian or European Government. This project was possible thanks to research performed by the University of Florence, support from the local council and Tuscan Region and foremost the cooperation among farmers, millers and bakers as well as the whole local community participating in the activities and buying the products. Adom, K, Dinelli, G, Marotti, I, Bosi, S, Benedettelli, S, Ghiselli, L, Cortacero-Ramirez, S, Carrasco-Pancorbo, A, Segura-Carretero A & Fernandez-Gutierrez, A 2007, ‘Lignan profile in seeds of modern and old Italian soft wheat (Triticum aestivum L.) cultivars as revealed by CE-MS analyses’, Journal Electrophoresis 28, pp. 4212-4219. Casini Benvenuti, S, Rossi, E 2014, Toscana 2020, Il Sole 24 Ore, Milano, Italy. Becherelli, L 2013, ‘Il miglioramento genetico dei grani teneri: il contributo della Toscana’, Pane Nuovo da Grani Antichi, Provincia di Siena, Siena, pp. 97-114. Benedettelli, S, Castioni, F, Ghiselli, L & Martinelli T 2013, ‘Pane nuovo e pane antico: evoluzione delle varietà di grano, dalla tecnica molitoria e panificatoria’, Pane Nuovo da Grani Antichi, Provincia di Siena, Siena, pp. 25-47. Dyson, Stephen 2003, The Roman Countryside, Duckworth, London. Francovich, R, & Hodge R 2003, Villa to Village: The Transformation of the Roman Countryside in Italy, Duckworth, London. Landi, R 2004, ‘Sistemazioni idraulico-agrarie (2004), in Italia’, Atlante dei Tipi Geografici, Istituto Geografico Militare, pp. 407-409. Nanni, P 2012, Uomini nelle campagne, Quaderno RSA N.9, Florence. Sofi, F, Ghiselli, L, Cesari, F, Gori, AM, Mannini, L, Casini, A, Vazzana, C, Vecchio, V, Gensini, GF, Abbate, R & Benedettelli, S 2010, ‘Effects of short-term consumption of bread obtained by an old Italian grain variety n -lipid, inflammatory and hemorheological variables: an intervention study’, Journal of Medicinal Food no. 13, pp. 1-6.